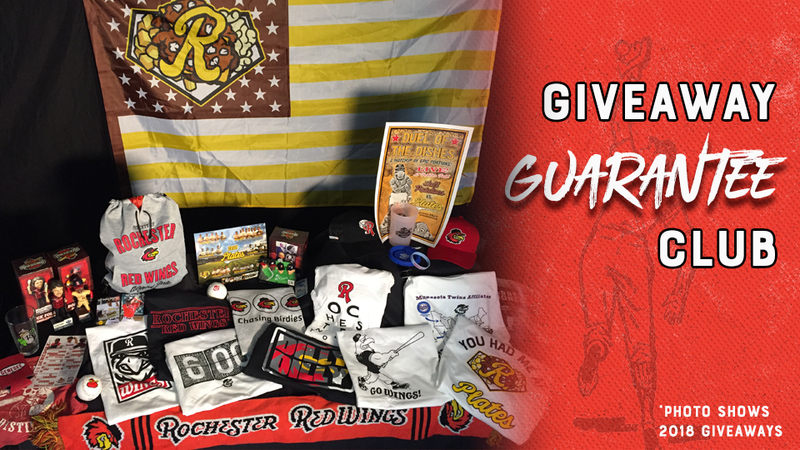 Home / baseball / CM / MiLB / Rochester / Rochester Red Wings / Sports / Join the Red Wings Giveaway Guarantee Club! ROCHESTER, N.Y. -- Join the Red Wings Giveaway Guarantee Club! For just $125 you'll be able to own ALL of our giveaways (both adult and kids giveaways) during the 2019 season. Only a limited number of Red Wings Giveaway Guarantee Club memberships will be sold. You can purchase a Giveaway Guarantee Club Membership online or by calling (585) 454-1001. Fans who join the club will present their membership card in order to redeem their giveaways at three different points of the season regardless of whether they received any of the giveaways at the gates. All giveaways MUST be picked-up at the ballpark, but you do NOT have to be in attendance on the night of each individual giveaway. -All April/May giveaways can be picked up beginning on June 3. -All June/July giveaways can be picked up beginning on August 5. -All August/September giveaways can be picked up beginning on September 9. The Wings typically offer between 20-25 giveaways a season and 2019 will be no different. We already have a cap giveaway, two bobbleheads, eight T-shirt Tuesdays and a bevy of other giveaways planned for this season. When purchasing your membership, please make sure to denote your t-shirt size (M - XL).